Though we love a classic wine country winery, the younger crowd in the bay area have been craving a breath of fresh air and they've recently gotten just that- in the form of Ashes & Diamonds Winery. This winery has quite literally taken Napa Valley back to the roots of its fame- the 1960's- and this can be seen in the decor as well as the wine making. Focused on the classic Napa Valley style cabs that made their world debut in the 60's and 70's, Ashes & Diamonds is making exceptional wine with an even better experience. We haven't seen a winery with such a clear aesthetic since Scribe Winery first made its debut, and we are loving this! 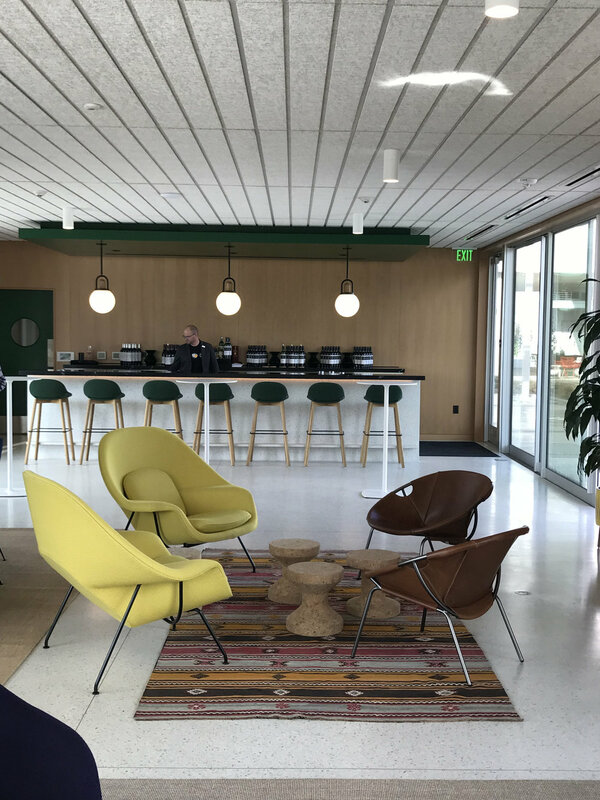 The mid-century modern decor, fresh color palette, and bold architecture are bringing youth back to the Napa Valley. Owner Kashy Khaledi's hope is to create classic, elegant California wines that are representative of site and vintage- something that is certainly easier said than done. He assembled an a-team of winemakers and growers to ensure that they are crafting some of the valley's finest vino. If you have the chance to stop by the winery, there are a few different options as far as experiences go. These range from your standard wine tasting, to a food and wine pairing, to an all out immersive tour and reserve tasting. In addition to the standard food and wine experiences, Ashes & Diamonds also has been hosting several workshop series this winter. Centered around woolens, baking, and wellness, each workshop series explores a different topic with experts in the field. Sign up and browse their offerings here. Ashes & Diamonds is bringing a fresh perspective to winemaking and Napa Valley style and we want to know what you think about it! Leave us a comment or suggest the next place we should go. One of the greatest parts of working and living in Sonoma Valley is the exceptional food and wine- and we have rounded up the perfect date ideas for your favorite foodie. Whether you are spending Valentine's day with your partner, your best gal pals, or just family and friends, any of these events and workshops are the perfect gift for the foodie in your life! We've rounded up a few of our favorites here for you from across Sonoma Valley. Our first pick is a classic Sonoma foodie experience- a cooking class at Ramekins Culinary School. These classes are hands on, educational, but a fun and casual experience that is perfect to gift to any aspiring chef, or just someone with an appreciation for good food! Not only will you walk away having learned new techniques, recipes, and chef-worthy tricks, but you also get to enjoy some fabulous Sonoma wine and a great meal that you help to prepare. Some upcoming classes are home baked bread 101, Spanish seafood specialties, and perfecting pizza. Click here to sign up! We have all dreamed about what it might be like to make our own wine, and Raymond Vineyards will let you be a wine maker for the day! Learn the winemaker’s art while blending your own red wine from Napa’s esteemed appellations. Following the blending session, take home a bottle of your own special blend that same day featuring your own custom label; order cases of your personally-crafted wine to share with friends and family at any time! A great experiential gift for your beloved wine-o. Click here to purchase the experience and start your wine making journey! If you and your valentine aren't the do it yourself types, these options might be more your style. First, check out this Valentines Weekend Mushroom Bisque and Truffle Wine Pairing from Family Wineries Dry Creek. Enjoy the pleasures of Wild Mushroom Bisque and a Chocolate Truffle with the Family Wineries Dry Creek collective. Glenn's 5th year preparing his own special recipe of Wild Mushrooms including Black Trumpets, Yellow Foot, Chantrelles, Porcini and Crimini in a vegetable stock puree. And a scrumptous little truffle bite. Complimentary for Family Wineries Wine Club Members Exclusive Benefit, $25 for General Public. Click here to reserve your spot! If your true love comes in the form of a great steak and glass of red wine, then the ranch to table winemaker dinner featuring Balletto vineyards and grounded grassfed ribeye might be for you! This unique dining experience will feature wines from winemaker Anthony Beckman at Balletto Vineyards & Winery (Russian River AVA) paired with grassfed Ribeye steaks sourced from Byron Palmer & Nate Chisholm of Grounded Grassfed (Petaluma) with courses prepared by Executive Chef Joe Farinacci at the historic Wild Oak Saddle Club. Click here for more information! While you can't go wrong with any of these options, we hope you pick the perfect pairing for your Valentine's day this year! We think these date ideas are perfect for your favorite foodie and showcase all that Sonoma Valley has to offer.